The previous lawsuit against the governor of Ekiti, Ayodele Fayose, is reported to start in front of a federal court in Lagos on Monday. Prior to the trial, the Economic and Financial Crime Commission is to transfer Fayose from Abuja to Lagos this weekend. According to The Nation, the EFCC confirmed on Friday that Fayose has received a lawsuit and trial announcement. 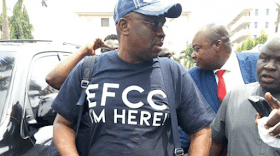 The ex-governor is in court in connection with N2, 299 billion and $ 5.3 million allegedly assigned to him by the National Security Advisor (ONSA) office in N4, 65 billion slush fund, allegedly shared by ONSA.